PNB dancer Leta Biasucci in George Balanchine's "Diamonds"
The “it” Biasucci refers to is the grueling training, the daily hours of practice essential for anyone to make it as a professional ballet dancer. Thousands of little girls (and maybe hundreds of little boys) dream of being on stage. The truth is, the sparkly, seemingly effortless performances are the result of years of constant hard work. Only a few dreamers have the talent and discipline it takes. On a recent Tuesday morning, Biasucci and a roomful of her fellow PNB company members warm up before the daily 90 minute class that starts out each day at the ballet company. There are no tutus, no tiaras here. Most of the dancers wear ratty tights, leg warmers, tee shirts that advertise dance clothing companies or past arts festivals. At 10:15 sharp, PNB Artistic Director Peter Boal comes to the front of the room to put his dancers through their paces. “We’ll start with plies,” Boal says. Each dancer places a hand on the nearest barre, bending slowly at the knees until thighs are parallel to the floor, heels lifted. With arms gracefully arced overhead, they rise up from the deep bend, then sweep their torsos forward from the waist, heads stretched toward their toes. This is the first of a series of exercises that become increasingly complex as the class goes on. A pianist in the corner keeps up a steady accompaniment. Leta Biasucci is positioned near Boal at the front of the studio, her curly dark hair pulled back from her face. At 24, Biassucci is one of the younger company members, but already she’s invested years training for this job. She started ballet classes as a five year old in Pennsylvania. At 9, Biasucci enrolled in the Central Pennsylvania Youth Ballet, considered a “serious” dance school. The young girl was attracted to the rigor of the daily classes. She spent every afternoon there. “Maybe I liked it because I was sort of good at it,” she laughs. To succeed at ballet you need to be more than “sort of good” at it. According to Peter Boal “I don’t know that it has to do with the gifts that you receive when you’re born.” More so, Boal believes a dancer’s success is built on determination and intelligence. By the age of 16, Leta Biasucci thought she had what it takes to pursue a professional dance career. She was accepted to San Francisco Ballet’s trainee program, where she attended class and dreamed they might hire her when she finished the program. 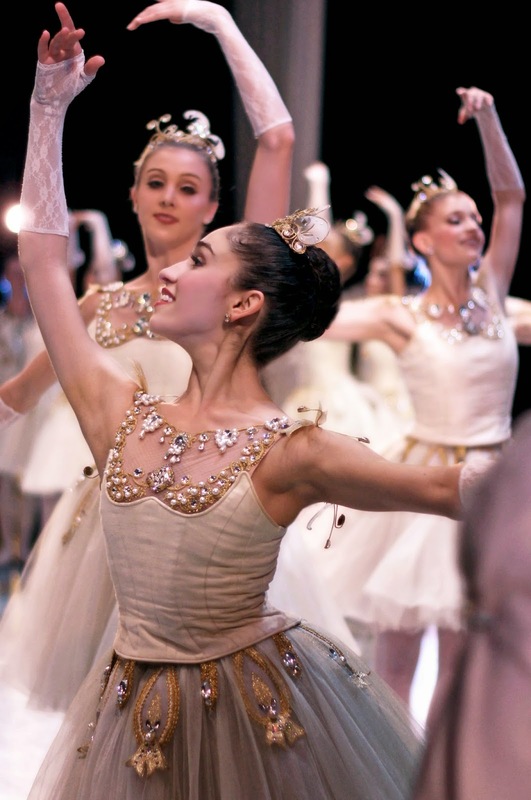 Most big companies like SF Ballet hire only a handful of trainees or apprentices every year. Biasucci didn’t make the cut. She consoled herself with a job at the smaller Oregon Ballet Theater. She was happy to be dancing professionally, but still, she dreamed of something more. After three years in Portland, Biasucci decided to audition for Pacific Northwest Ballet. That’s ballet-speak for an audition. But there was something about this girl that intrigued him. She confesses, the second time around, she was better prepared for what Boal would demand of her. As the head of one of the best known ballet companies in the nation, Peter Boal can make or break a young dancer’s career. He likes to remind his students that they shouldn’t take his rejection as a final say on whether or not they’ll make it as professional dancers. But Boal is a taste maker. And Leta Biasucci was a dancer to his taste. Boal clicked with Leta Biasucci. A month after her second visit to PNB, he offered her a job in the corps de ballet. The corps are the dancers you usually see grouped at the back or sides of the stage, framing the stars of each performance. They’re like supporting actors in a film, or the chorus in a big Broadway show. Each corps member dreams of being singled out from the crowd. Realistically, only a few will realize that dream. Sometimes it takes a lucky break. For Leta Biasucci, that break came during a run of the classical ballet “Coppelia”. She’d studied the title role, but Biasucci wasn’t likely to get a chance to perform it. Leta Biasucci as Cupid in Alexei Ratmanksy's "Don Quixote"
Since that performance, Boal has selected Biasucci for a bevy of featured roles. She’s thrilled with the opportunities, but the spotlight can be scary. She has to deliver the goods in each performance, to prove she earned that spotlight. Biasucci has been learning a new role for PNB’s upcoming production of “Giselle.” It’s a featured duet she’ll dance with company veteran (and audience favorite) Jonathan Porretta. At a recent rehearsal, Biasucci’s billowing tulle skirt throws her off. She’s flustered and embarrassed by her mistakes. Porretta and ballet master Paul Gibson calm her down and the second run through goes much more smoothly. Biasucci’s boss, Peter Boal, says the promotions are coming for Biasucci. Sometimes Leta Biasucci has to remind herself that, whether or not she gets her promotions, this is the life she has worked for since she decided to become a ballerina at the age of 9. Leta Biasucci, with James Moore, in Kent Stowell's "Nutcracker"
Heads Up Seattle Dance Fans!